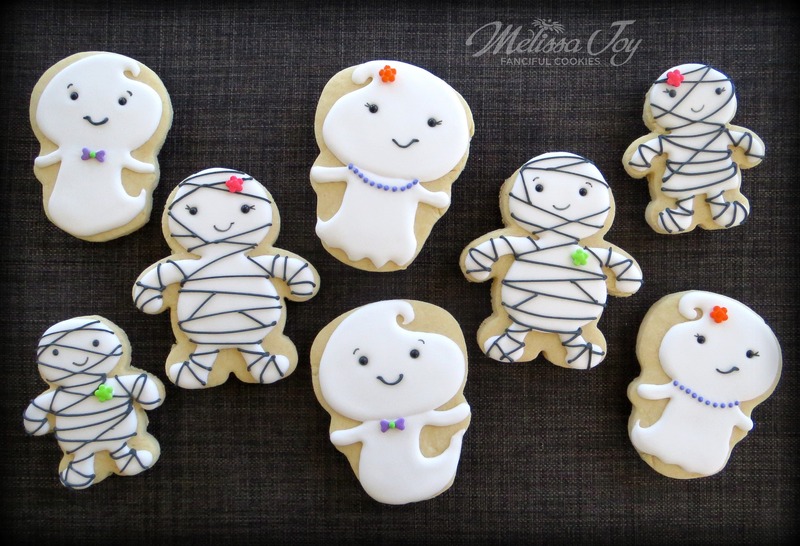 Easy Ghost and Mummy Cookies for Halloween! It turns out my youngest is a bit scared of Halloween this year. So much so, he may choose to stay home instead of trick-or-treating. Not even the lure of candy will get him out there. I’m not sure what spurred this sudden wariness about the holiday, but I know he’s freaked out by the creepy stuff, and that I completely understand. I have never been to a haunted house, enjoyed being frightened, or wanted to watch gory movies. Blech. Call me a wimp, but it’s just not my thing. In my world, Halloween is full of cute stuff. 1. My ghost cookie was made with a skull cookie cutter, just the right size for the design. The first step is making the head and giving it a little swirl at the top. Place the candy pearl eyes in position while the icing is still wet. I forgot a few times, and well, they don’t stick when the icing sets! Alternatively, you could pipe the eyes on, but I liked the look of the pearls better. 2. Allow the head to dry a bit, then give the ghost a body. I gave the “girl” a scalloped bottom and the “boy” swoosh. 3. After this has set several hours or overnight, you can add the details. Little lashes for the girls and eyebrows for the boys using a food writer. The ladies got a flower candy sprinkle and a bit of bling, while the boys received a bow tie made with two heart sprinkles and a dot of RI. Add a sweet smile and you’re DONE! Not so bad, right? 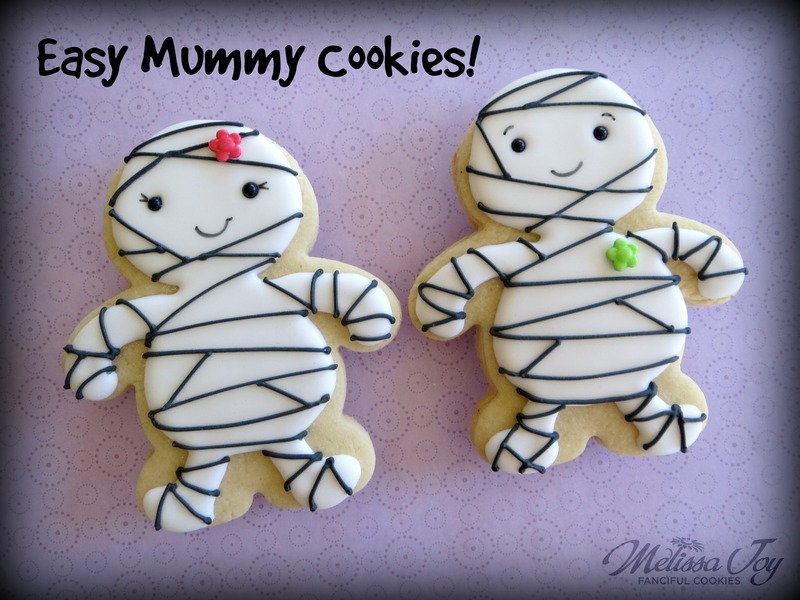 Next up, and my favorite of the two designs, an easy mummy cookie! 1. The dough started out as a bear, but with an quick trim, it became the perfect mummy body. A gingerbread cookie cutter would work as well. 3. I added the arms and legs and shaped them a bit with my scribe tool as shown. 4. Let the body dry for several hours or overnight. Add lashes with a food writer for the ladies and eyebrows for the guys. It is a good idea to place the features now and work around them in the next step. If not, your lines can get in the way of his/her face. 5. Using a thicker black RI, go willy nilly with your mummy wrap! 6. You can add a flower sprinkle at the top for the girls and as a boutonniere for the boys, using a drop of RI to adhere them. After that, you’re finished! Come on now…there is not a stitch of spookiness with these Halloween cookies, is there?! They should pass the ultimate cute test. All treats, no tricks, I say! Once these were finished, I decided they would be perfect as my contribution to an amazing event, the GO BO! Foundation Bake Sale. Held in Door County, WI, this will be the third year of cookies that Pay It Forward and in a BIG way. Cookie artists from every state and many countries have agreed to donate their sweets out of LOVE and COMPASSION, to raise money in honor of an incredible boy who lost his battle with cancer, and who’s mother created a foundation set up in his name. As bakers, we are just trying to live out his wishes to be kind to each other and help one another out, the best way we know how…by sharing our talents to do good, one cookie at a time. You can read Bo and Annika’s personal story here (make sure you have tissues), find out about the epic bake sale on the Facebook page Go Bo Foundation Bake Sale, and learn more regarding the foundation at www.gobofoundation.org. 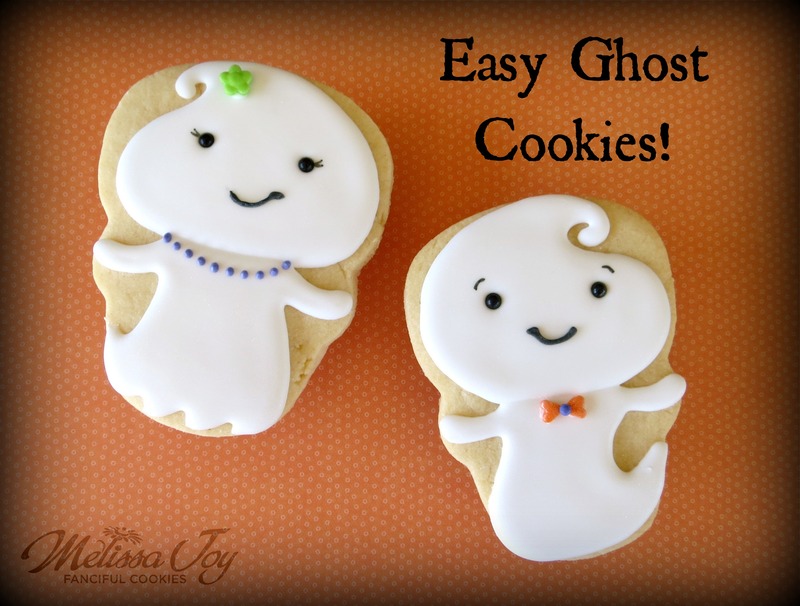 This entry was posted in Cookie Tutorials, Cookies for Kids, Fall Cookies, Halloween Cookies and tagged easy halloween cookies, ghost cookies, GO BO! Foundation Bake Sale, Halloween Cookies, halloween cookies for kids, mummy cookies. Bookmark the permalink. Congratulations Melissa! So looking forward to seeing what you do next! These are so cute. So glad you posted this tutorial. Thank You!!! These are AWESOME!! I love love love an alternate cutter idea, a simple design with few colors, happy faces, and sprinkles! These make me so happy! Fabulous Melissa and of course, thanks for the shout 🙂 CK beads rock! These are sooooo darn CUTE, Melissa! I love cute over gory any day! I especially am enamored with the mummies:) What size pearls did you use? The smallish ones? It says 4mm on the container, if that helps you out! 🙂 Thanks for stopping by, Sue! These guys are SOO adorable!! Oh my gosh, those are so SO cute!!! I just love your work! I do! For order inquiries, you can contact me at melissajoycookies@gmail.com.